I’ve been to this temple few times over the last few years. The location of this temple is located closer to Chinatown. Its a very busy location. This temple has a lots of history to it. Very nicely built temple. It feels so peaceful and divine to be at this temple. The staff are maintaining the temple with very high standards and efforts and we can see that from the cleanliness of the temple. Sure had a wonderful time of worshiping with my family. 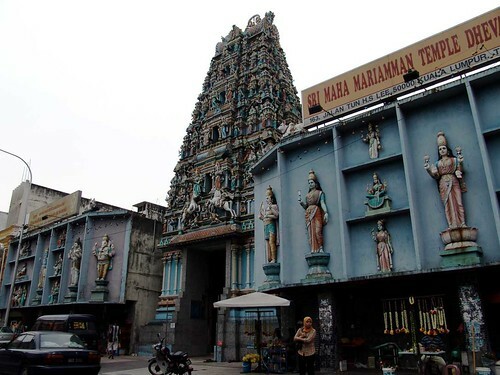 This is by far the best kept up temple in Kuala Lumpur but does not beat the small Hindu temple in Malacca as it is pretty charming and older worldly – like going back in time. The priest that I saw at this temple did an outstanding pooja worship and was a perfectionist and master in his sanskrit verse. I went to an afternoon and an evening service and did not find the evening service composed as well as the noon one. There is a lot of music that goes along with the slokam or sanskrit verse so it gives a mythical feel. Some of the people who run the service do not speak english well though so when asking for a tap to wash my hands before eating someone said no to me but later I saw one. So some communication barriers there for sure. Also some of the volunteers act a bit pious or too proud so that puts a bit of airs to the atmosphere. Probably the results of colonization and suffering the Tamil people went through under british suppression. They are strict about shoes not being put in your own bag and will be almost abusive if you do not do as they abide. Of course most all us know that we are not supposed to wear shoes inside Hindu temples- I guess this is a bit of the repercussions of what the British did to the Tamils as most Brits have a very controlling and paternalistic demeanour. This temple was quite small compared to one we visited in Little India but it was full of bright artwork, atmosphere and worshippers seeking solace and praying. It wasn’t crowded at all and this temple allowed you to take photographs whereas the one in Little India didn’t. The people were so friendly, posed for photos and interacted happily with us. Some members of our group were invited to attend a family wedding in a few weeks. I enjoyed it and it was a good example of a Hindu Temple. Located close to Central Market. It was a humbling experience being in such a beautiful place of worship. I got lucky the day I went and watched a completely traditional Indian wedding with gorgeous bride and groom. I watched for about two hours and they invited me to join their party – free food, free drink, it was great. I had no idea what they were saying but the experience was worthwhile. Make yourself unobtrusive and be genuinely interested in what is happening and people often want to include you in their celebrations. 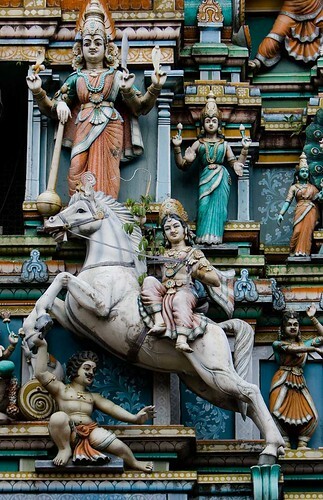 History reveals that the Sri Maha Mariamman Temple was first established in 1873. But it was meant as a private shrine of a Tamil family from southern India. After that it was rebuilt on its present site in 1885. Currently the temple has become Kuala Lumpur main Hindu temple and it plays an important role during Thaipusam festival. The unique feature of the temple is that the temple is laid out in the form of a reclining human body, with the head pointing to the west and the feet to the east. The feet are represented by a five-tiered gopuram or entrance gate which is decorated with intricately carved statues of various Hindu deities. An extensive renovation of the temple in 1960 has added gold and previous stones while Spanish and Italian tiles were added to the gopuram. The interior of the temple are several altars displaying images of Hindu gods. The temple also houses the ornate silver chariot used in the procession during the fascinating annual Thaipusam festival. The chariot is brought out from the temple’s vault during the celebration, when up to a million devotees converge here and make their way up to the Hindu shrine at Batu Caves. Visitors must remove their shoes before entering the temple. The temple is located about 15 minutes walking distance from the Pasar Seni LRT station. Best deals on hotels within walking distance! Kuala Lumpur City Centre (KLCC) – The KLCC is listed within the most visited tourist destination in Kuala Lumpur simply because the area is made up of multiple attractions including the Suria KLCC, KLCC Park, Aquaria KLCC, and of course the magnificent Petronas Twin Towers. Merdeka Square (Dataran Merdeka) – The Merdeka Square or Dataran Merdeka is a place of history. You could find many of the great history events took place in Kuala Lumpur here. One of which is the lowering of the Union Flag performed here on August 31st, 1957 when independent Malaysia was born. Attractions include Saint Mary’s Cathedral, Royal Selangor Club, Sultan Abdul Samad Building, Central Market and National History Museum. Chinatown – The Kuala Lumpur Chinatown is within the most visited tourist destination due to its vibrant economic and cultural activities including the famous Petaling Street Market. The Chinatown also encompasses other historically rich heritages such as the Sri Maha Mariamman Temple, Chan See Shu Yuen Temple, Sze Ya Temple, a Sikh temple, a Gospel church as well as the famous Islamic mosque, Masjid Jamek. 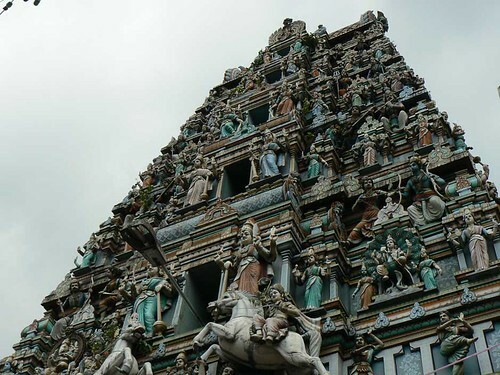 Little India – If you are planning to get to know more about the multi-culture society of Malaysia, the Little India is definitely the place you must not miss. This vibrant Indian enclave is a living heritage that can be dated as far back as 100 years old. Some famous attractions at Little India are the Masjid India and the neighborhood of Jalan Tuanku Abdul Rahman.